Our public schools are at a crisis point. Federal funding for public education has remained at 2% of the federal budget for decades, despite the increase in public school enrollment and the rising cost of education resources and services. This disparity between funding and actual cost means that Congress has essentially made cuts to classroom budgets across the nation. These overall classroom funding cuts couldn’t be coming at a worse time. Today’s classrooms are more in need of funding than ever—most public-school students are now from low-income families, yet federal spending for high-poverty schools has decreased by more than 8% in recent years. There are also more students with special needs in our nation’s schools than ever before, but funding to serve these students has also decreased. Congress must agree on the federal budget by Oct. 1, 2017. With restrictions on how much the government can spend in fiscal year 2018, there is a strong possibility that funding for education will be cut. Already this year, President Donald Trump proposed cutting $9.2 billion. More recently, the U.S. House of Representatives proposed a cut of $2.4 billion. Both proposed cuts would be extremely damaging to public schools that already struggle to give students the education they deserve. All PTA members and education advocates must take a stand. Tell your friends and family to demand that Congress “STOP Cuts to Classrooms” and invest more than 2% in public education before the Oct. 1, 2017 deadline. One way to spread the word is by doing the National PTA #STOPCutsToClassrooms social media challenge. It’s easy! Then, take a picture and/or videoof yourself holding the “I signed the petition to #STOPCutsToClassrooms” official sign and post the image on your social media platforms. Finally, tag up to three friends to encourage them to do the same. For those who have already signed the petition and taken the challenge, please continue to participate in Funding Fridays every Friday until September 29. Also stay tuned for the release of a #STOPCutsToClassrooms letter to Congress in September. 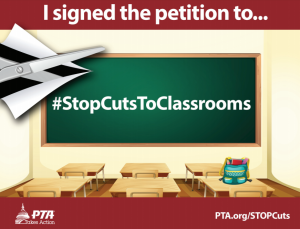 For more information about the #STOPCutsToClassrooms campaign and to learn more about the state of federal funding for education programs, visit PTA.org/STOPCuts. On May 24, 2017, President Donald Trump released his budget proposal for the federal government for Fiscal Year (FY) 2018 which included a proposed cut of $9.2 billion to the U.S. Department of Education from last year’s funding level. This proposed cut to education programs comes on the heels of Congress cutting funding for federal education programs in FY 2017. The President’s budget would maintain the same level of funding from FY 2017 for Title I, which aids schools with high percentages of children from low-income families, special education grants through the Individuals with Disabilities Education Act (IDEA) and Parent Training and Information Centers (PTIs)—centers that provide information and services to families to help support students with disabilities. Additionally, the President’s budget does not include investments for family engagement in education through the Statewide Family Engagement Centers (SFECs) program and eliminates more than 20 education programs including: educator professional development; after school programs; preschool grants and grants that aim to ensure students receive well-rounded educational opportunities, learn in healthy and safe school environments and have opportunities to use technology in the classroom. 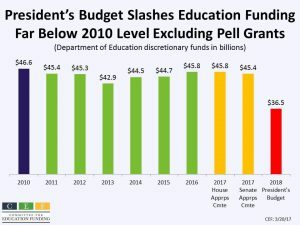 On top of these cuts, the President’s budget includes a new $250 million grant program that would allow public dollars to be used for private and religious school tuition. National PTA has a long standing position opposing private school choice systems that would divert public school resources. National PTA is also concerned about a new grant program in Title I that would allocate $1 billion to “follow” a child to any public school which would significantly impact the distribution of funds across and within Title I districts and create division and separation within communities. Federal funding for education programs has remained at 2% of the federal budget for decades, despite continuous growth in public school enrollment and the increased cost of education resources and services. The President’s budget would decrease the federal investment in education below 2%. Such devastating cuts to education at the federal level are combined with state and local cuts to education that further lessen the opportunities for every child to reach their full potential. It is important to remember that the President’s budget proposal is exactly that, a proposal to Congress outlining the Trump Administration’s priorities. The funding power lies with Congress to decide what federal programs will be funded and at what levels each year. There is a need to invest more in education programs at the federal level. Federal funding for education at, or below, 2% of the federal budget is a cut to classrooms. If you agree that 2% of federal funding for public education is not enough and future cuts to education would be catastrophic for the future of our children, Take Action today and tell your member of Congress to increase investments for public education so that every child’s potential becomes a reality. Make sure to follow us on Twitter @National PTA and sign up for the National PTA’s Takes Action Newsletter to participate in the advocacy campaign and receive the latest information on PTA’s advocacy efforts. As parents, we know sometimes our children may not make the best decisions, which is why second chances are important to give to children as they learn and grow into adulthood. However, for far too many youth, one mistake may drastically change their futures. The U.S. Department of Justice reports that police make over 600,000 juvenile arrests each year and juvenile courts handle roughly 1.2 million cases resulting in 55,000 children placed in secure confinement for non-violent offenses, such as breaking curfew. In addition, a recent report—2016 Citizen-Readiness Index—further analyzes the state of our nation’s youth. The report finds that a large portion of our youth are unprepared to positively contribute to our nation and that a quarter of young adults in America have an arrest record that impacts their education, postsecondary and career opportunities. Parents and community leaders have been advocating for improvements to juvenile justice laws nationwide for decades, yet we still need more opportunities for our most vulnerable youth. This week, the U.S. House of Representatives took a step forward to improving our juvenile justice system by passing the Supporting Youth Opportunity and Preventing Delinquency Act (H.R. 5963), a bill that would reauthorize the Juvenile Justice and Delinquency Prevention Act (JJDPA). National PTA and 40 state and national organizations signed on to the Act 4 Juvenile Justice Coalition letter in support of H.R. 5963. The bill would improve federal laws to prevent children from entering the juvenile justice system, protect youth currently in the system and provide greater opportunities for at-risk youth leaving the system so that every child has the opportunity to reach their full potential. National PTA supported a similar JJDPA reauthorization bill (S. 1169) that passed out of the Senate Judiciary Committee in July 2015. The association is encouraged by the bipartisanship of both chambers to introduce a JJDPA reauthorization bill this Congress. National PTA urges the Senate and House to work together to ensure a JJDPA reauthorization bill is signed into law before the end of the year. View National PTA’s press release applauding the Supporting Youth Opportunity and Preventing Delinquency Act (H.R. 5963) and follow @NationalPTA on Twitter for updates and information on the reauthorization of JJDPA. Phi Delta Kappa International (PDK) annual poll on the public’s attitude towards education was recently released. The poll revealed mixed views on education, but showed a strong relationship between school satisfaction and how engaged parents feel about their child’s school. Less than half of the survey respondents (45%) believe that the role of public education is to prepare students academically, while the remainder of participants believe public education is to prepare students for the workforce (25%) or for citizenship (26%). While Americans may not agree on the role of public education they do agree that a lack of funding for education is the number one problem that public schools face. Seventy percent of respondents support increased property taxes for school improvements. 55% of parents oppose allowing students to opt out of standardized tests. 56% of parents say their child has the right amount of homework. 79% of parents review their child’s grades often. 56% of parents say the new education standards have changed what’s being taught in their child’s classroom and 45% of those parents think it is for the better. Another important finding from the survey was that a school’s ability to effectively communicate with families and provide frequent opportunities for input greatly influenced the parent’s opinion of the school’s performance. Sixty percent of parents reported they were satisfied with their child’s school’s ability to keep them informed and involved. The poll shows that two-thirds of public school parents gave their child’s local school an A or B when they felt there was a strong family-school partnership. 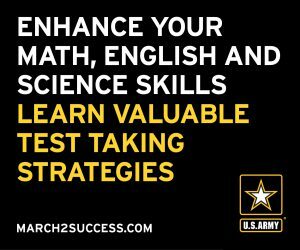 The survey findings arrive in the wake of the passage of the Every Student Succeeds Act (ESSA)—the new federal law governing K-12 education—which strengthens family engagement provisions and provides more state and local flexibility over their accountability systems, assessments and standards. Under ESSA, parents and other education stakeholders are required to be meaningfully consulted and engaged in new education plans and implementation of the law. ESSA also included the Statewide Family Engagement Centers (SFECs) grant program as a standalone program in the law to strengthen family-school partnerships and parent-teacher relationships. For the 15th consecutive year the PDK poll has found that Americans believe the biggest problem facing schools is the lack of financial support for education. Despite the findings on the importance of family engagement in schools and the need for more education funding, both the Senate and House Appropriations Committees did not invest in SFECs this year. Funding family engagement programs, such as SFECs, is imperative to school improvement and student success. The PDK poll results send a clear message to Congress that the public desires more investments in education and more family engagement in schools. National PTA and our members will continue to advocate for SFEC funding in FY 2017 and for family engagement to remain an essential part of the ESSA implementation process. Our association is committed to providing our members resources on the ESSA implementation process and ways to get involved at PTA.org/ESSA. Sign-up to receive our PTA Takes Action e-newsletter and follow @NationalPTA on Twitter for updates and information on other National PTA priorities. It’s just common sense: healthy students make better learners, and school meals are an opportunity for children to receive more than half of their daily nutrient needs. Ensuring children have access to nutritious foods in schools is critical to their success. 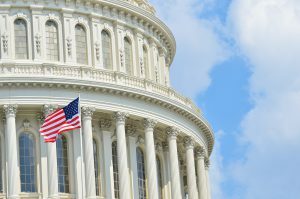 The U.S. House of Representatives’ Education and the Workforce Committee will hold a markup of the House’s child nutrition reauthorization bill, titled the Improving Child Nutrition and Education Act of 2016 (H.R. 5003), at 11 a.m. on May 18. National PTA and many school nutrition advocates are concerned with the House bill in its current form as some of the provisions are expected to roll back years of progress toward healthy and nutritious school meals. The following are just a few of the provisions in the House bill that would negatively impact your child’s access to healthy foods in schools. The Healthy Hunger-Free Kids Act (HHFKA) was passed by federal lawmakers in 2010 to improve the nutritional value of all foods and beverages sold in schools. HHFKA requires a school lunch to include a fruit or a vegetable, whole-grains and low-fat dairy products. It also sets limits on calories, fats, sodium and sugar content. To date, the United States Department of Agriculture has reported that 98.5% of schools are successfully meeting the updated nutrition standards. National PTA has helped further these efforts in schools through our Healthy Lifestyles program and Healthy School Meals Grants. However, the House bill would roll back these efforts by allowing popular foods in certain regions of the U.S. (such as biscuits, grits, white rice and others) to be exempt from the whole grain requirements as well as delaying the implementation of sodium reduction targets in school meals. National PTA has also been working with schools to implement healthy and nutritious fundraisers that adhere to the Smart Snack guidelines that went into effect in 2014. PTAs across the country have been working hard to improve school meals and other food items sold during the school day. Thus, PTA cannot support the House bill’s language that would exempt school fundraisers from the Smart Snack guidelines when countless schools have proven to hold successful fundraisers that are healthy and nutritious, such as selling healthy snacks at school stores and school-wide run-a-thons. The Community Eligibility Provision (CEP) was included in HHFKA to allow schools and districts with high poverty rates to provide free breakfast and lunch to all students who attend that school or district. This has reduced the administrative burden on schools and the stigma children and families face while participating in the free and reduced-price school meals program. The House bill would hinder access for 7,000 schools and millions of children from receiving healthy school meals by increasing the eligibility requirements to participate in the program. Find out if your child’s school would be effected by this provision by visiting this searchable database. This provision in the bill is of great concern to PTA as one of our founding principles is our dedication to engaging families in their child’s education, which research has shown improves student outcomes. Limiting the amount of communication a school may have with families on any issue is detrimental to the school environment and student learning. Parents and families have a right to know what school-based opportunities are provided to their child throughout the year, which includes the health and nutrition of their child. Sign-up to receive our PTA Takes Action e-newsletter and follow @NationalPTA on Twitter for updates on the bill and information on other National PTA legislative priorities. 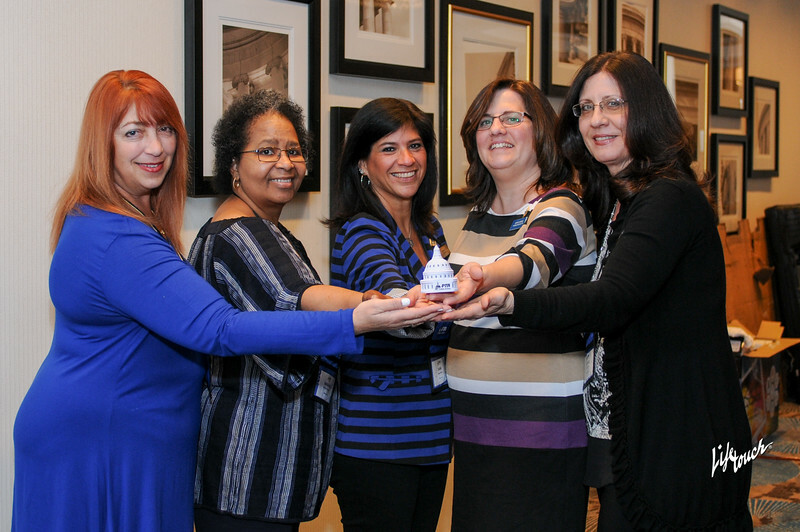 More than 200 PTA members nationwide attended National PTA’s 2016 Legislative Conference (LegCon) to hone their advocacy skills and learn new ways to strengthen their PTA voice. During workshops and panel discussions, PTA leaders heard from experts about best practices to expand their grassroots network of PTA advocates, build relationships with policymakers and how to amplify their message through social media. On the last day of LegCon, PTA advocates met with their elected officials on Capitol Hill to discuss key issues affecting children and families, including obtaining funding for Statewide Family Engagement Centers (SFECs) in the Every Student Succeeds Act (ESSA). PTA members’ dedicated advocacy efforts and collective voice resulted in 38 Representatives and 22 Senators signing on to a Dear Colleague letter in support of funding SFECs. To push back against the expected budget cuts to federal education programs, it is imperative for PTA members to continue to be engaged with Congress in 2016. The LegCon workshops and trainings have been uploaded to the LegCon website and can be utilized year-round to expand PTA members’ advocacy efforts at all levels of government. By developing a strong line of communication with your members of Congress and their staff, our association will be able to meet our policy goals that will help to improve the lives of children and families across the country. Sign-up to receive our PTA Takes Action e-newsletter and follow @NationalPTA on Twitter for updates on National PTA legislative priorities. Last month, the Senate Committee on Agriculture, Nutrition and Forestry unanimously passed bipartisan legislation—Improving Child Nutrition Integrity and Access Act of 2016—to reauthorize the Child Nutrition Act/Healthy Hunger-Free Kids Act for five years. The bipartisan reauthorization in the Senate comes after years of debate on how to move forward with school nutrition standards—even though the U.S. Department of Agriculture (USDA) announced in October that 97% of schools were successfully meeting updated nutrition standards. As part of the bipartisan compromise, the bill would keep the current fruits and vegetables requirement intact—that all students must have at least a half cup of fruits and vegetables with every federally funded school meal. However, grain and sodium requirements are expected to change through USDA’s rulemaking process (instead of the legislative process) before the next school year. The new regulations for rulemaking would consist of delaying target 2 sodium restrictions in schools from school year (SY) 2017-2018 to 2019-2020 and lowering whole grain-rich requirements from 100% of grains served in schools to 80%. Although National PTA is not in favor of these changes, our association is still in support of the overall bill. The bipartisan compromise preserves the progress made on school nutrition standards as well as school breakfast and lunch programs while keeping the child nutrition reauthorization process moving forward. The bill also contains many key elements of the School Food Modernizations Act (S. 540)—that National PTA supported. The reauthorization bill would establish loan assistance and grant programs to help school districts upgrade their food service facilities and assist with staff training opportunities. The Improving Child Nutrition Integrity and Access Act is expected to move to the Senate floor for consideration in the coming months. 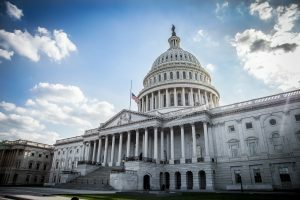 The House Education and the Workforce Committee has not released their reauthorization of the child nutrition act yet and the possibility of the House taking up the Senate bill is still unclear. Earlier this month, the American Civil Liberties Union (ACLU) filed a federal lawsuit against a sheriff’s department in Kentucky after an eight-year-old boy and nine-year-old girl with ADHD and additional disabilities were handcuffed by the deputy sheriff for conduct related to their disabilities. The deputy sheriff used the handcuffs as a restraint on the students by positioning the handcuffs on the student’s biceps locking their arms behind their back, which the ACLU argues is a violation of the Americans with Disabilities Act. Seeks to educate the school community and parents about the risks of excessive and/or inappropriate use of restraint and seclusion by untrained school personnel. National PTA also promotes the use of positive or non-aversive interventions for school discipline. There is overwhelming evidence that the use of restraint and seclusion on children is dangerous, life-threatening and not an effective technique for discipline. This also continues to be used across many states and school districts. For instance, according to the U.S. Department of Education, students with disabilities represent 12% of public school students, but are 75% of all students subject to physical restraint and 58% of students subject to seclusion. The 2011-12 Civil Rights Data Collection found the use of restraint and seclusion to be significant with over 110,000 student cases documented, absent of data entries from multiple states and districts that do not report on restraint and seclusion. In 2009, the United States Congress introduced legislation to regulate the use of restraint and seclusion in schools across the nation, but no federal legislation has become statute. National PTA has supported the Keeping All Students Safe Act in the last few Congresses and will continue to support legislation that reduces the use of restraint and seclusion in schools. The lack of federal action has led many states to create their own restraint and seclusion statutes and guidelines that vary widely. The Autism National Committee captured the legal landscape of restraint and seclusion laws nationwide in a recent report that found that only 25 states have laws providing meaningful protections against restraint and seclusion for all children and 35 states provide protections for children with disabilities. Kentucky was one of the states that fell under both categories of meaningful protections, but there are many caveats and exceptions that limit children’s protections under state laws—such as room descriptions, types of restraints and seclusion, and what constitutes emergency and life-threatening situations compared to everyday actions. Many states do not even require parental notification when restraints or seclusion has been used on a child, limiting the parent’s ability to take action and correct the problem so that their child can learn in a safe environment. National PTA will continue to support evidence-based alternatives to seclusion and restraint— such as positive behavioral interventions—that work to improve a child’s actions in school. We encourage parents and families to be aware of their school’s discipline policies and the restraint and seclusion laws of their state in order to help create a safe a supportive school environment for all children. Stay in the loop! Sign-up to get our PTA Takes Action e-newsletter and visit our Takes Action Network for the latest advocacy news and legislative updates. [i] Emergency is defined as an unanticipated and already occurring event that is placing the individual or others in imminent danger of physical harm. The Senate Judiciary Committee on Thursday approved bipartisan legislation to reauthorize the Juvenile Justice and Delinquency Prevention Act of 2015 (JJDPA), which has protected the care and treatment of children and youth in the justice system for over 40 years. The bill, S. 1169—which Congress last reauthorized in 2002—would close loopholes in the law to prevent youth from entering the system for minor offenses, and make provisions to ensure the continuation of children’s education while detained and a smooth transition back into the classroom. National PTA believes that this bipartisan reauthorization is a positive step towards a safer and more supportive juvenile justice system that helps every child reach his or her potential. Earlier this month, we cosigned a letter in support of the bill with other national and state organizations. The bill will move to the Senate floor for further consideration. In June, Rep. Bobby Scott (D-VA) introduced a JJDPA reauthorization bill—H.R. 2728—in the House. According to a recent report by the National Juvenile Justice and Delinquency Prevention Coalition (NJJDPC), despite key reforms to reduce youth incarceration and detention, more than 600,000 children and youth are arrested each year in the U.S. A majority of these arrests could be more effectively treated in community-based settings. Over 60,000 of these young people are being held in detention centers awaiting trial—thousands for minor offenses such as skipping school. About 250,000 are prosecuted in the adult criminal justice system annually. Of nearly 55,000 children in state prisons, most are incarcerated for non-violent crimes. On any given night, more than 6,000 youth are held in adult jails and prisons. Our organization has advocated for a fair, safe and rehabilitative juvenile justice system for over 100 years, dating back to the association’s first resolution in 1899, addressing how children are handled in the judicial system. We continuously support the prohibition of incarcerating youth in adult facilities; addressing racial, ethnic and socioeconomic inequalities in the juvenile justice system; and finding alternatives to detaining nonviolent youth. Prohibiting children who commit status offenses—conduct that would not be a crime if committed by an adult such as breaking curfew, skipping school or running away—from being kept at a correctional facility. Encouraging alternative options for status offenders. Making sure detained youth are kept separate from adults. Providing clear directions for states to develop plans to reduce racial and ethnic disparities among youth who come in contact with the juvenile system. States and state education agencies would also need to develop plans and collaborate with juvenile detention facilities to continue a child’s education while detained and allow for a smooth transition back to the classroom. Keep checking our blog for updates on the JJDPA reauthorization process and other legislation to better the lives of every child in education, health and safety.